Crucita Condo Update: The 8th and final story has been poured! The Crucita condo building, Arena, Sol y Mar II has just had its 8th and final floor poured as of February 4, 2010. Construction on this beachfront property continues to proceed according to budget and is currently ahead of schedule. The completion date of the building is November 2010. Don’t miss out on this spectacular opportunity to own your beachfront condo at a discounted preconstruction price! For all the details, floorplans and photos take a look at our Ecuador Beachfront Condos page. “In October 2009 I was lucky enough to find Tom’s website (www.ecuadorbeachfrontproperty.com). I begged a few days leave from work to see Crucita and Arena,Sol y Mar firsthand in early Nov. The town is well off the “beaten path” but the continual roadwork up the coast from Manta will change this soon. 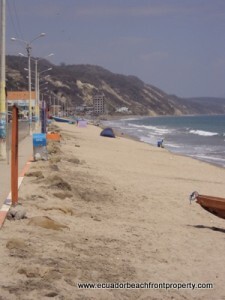 The town is a small fishing village with a wide sweep of beach, and popular with locals on weekends. My large room at Hostal Velodores was clean, convenient and reasonably priced (didn’t hurt that it was off-season)with free washer,(fitfull)computer access,and a near-empty courtyard pool. While exploring the condo site next door,I not only met the friendly yet diligent construction crew, busy forming the 6th-floor columns, but was able to meet the owner/engineer Sr. Raphael Andrade, who was most gracious in explaining the floor plan, construction technique,and purchasing process; we spent several hours together in Portoviejo with the notario completing the promesa de compre vende,securing me a phone chip,and admiring Mercedes engineering. He also contacted me later to note a math error that would give me a slightly lower price! Sr. Carlos Fuentes, the project’s architect is on site daily; Sr. Andrade visits as often as possible (weekly) from his home in Quito–his family will enjoy the top-floor penthouse, a fact that reassures me strongly about the quality of consruction and amenities. 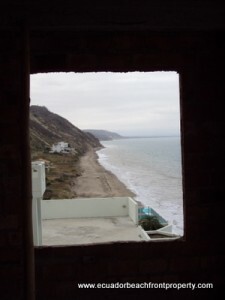 Construction of the beautiful beachfront condos in Crucita progresses according to schedule. Rafael, the lead engineer just informed us that the 7th floor was poured this month. The 8th and final floor will be laid during the beginning of February. Walkway access to the terrace of the adjacent condo where folks get together to grill, sun-bathe, sip a cocktail as they marvel at another beautiful sunset. Maintenance fees for all these services will be $20/mo. Each condo is 91 square meters or 980 square feet with 2BR/2BA. There are 2 condos per floor, both with expansive ocean views. If you want one large condo, you could buy two adjacent condos and ask Rafael to join them and personalize your floor plan! Pre-construction prices continue to increase as the project nears completion so if you are interested, the sooner you act, the more money you will save! Once completed, these will be THE premier condos in Crucita and will make for an excellent investment. Send us an email with any questions or to reserve your condo! Rafael has completed purchases from the US so you can jump on this deal without having to wait for a trip to Ecuador. Condo updates – New photos as of Dec 5th, 2009! Here are the latest photos of the Crucita condominium project taken just 5 days ago as the 6th story floor was poured. Construction progress is marching on at a steady clip and is very much on schedule. and here is the view of both projects from below. Interest is building as the project gets closer to completion and so now is the time to get a new condo. See our Condos webpage for more details, photos, and pricing information. Beachfront Condo in Ecuador for Christmas anyone? Prices start at $57,077! Lynn and I took a moment recently to pause for Thanksgiving, visit with family, and get caught up on things. We’re in Texas now, after having made our way from Chicago to Mobile, AL on the inland waterway system! It felt great to head south toward warmer climes… but the cold weather lately has us missing Crucita! We’ve had continued interest in the Crucita Condos and I’ve updated the Condos page. The prices have risen a bit as the construction continues and I suggest getting in soon. Three units are sold and two are reserved under contract as I write this on December 1, 2009. I’m posting the floorplans for the Condos here so you can get an idea of just how much space is available. There is still time to work with the architect to customize these plans if you have a different layout in mind. Eduardo has been doing a great job showing visitors our available lots and the condos. I also recently updated our Services page with info on staying with Eduardo and Paula while you’re in town at their condo. They offer full service dropoff and pickup transportation from the Manta Airport and are happy to show you around Crucita, Portoviejo, and Manta. Get in touch and plan a trip! Condo update – one more floor poured and ready! Progress continues at a rapid pace on the Crucita Condos we highlight on our website! Click here for the webpage. Here is the fourth story being poured two days ago. Here is the finished product the next day with workers already going on the columns for the fifth floor! and one from the second story with the palm trees in the foreground. Here are my parents enjoying the beach… we stayed in one of the finished condos for a month to get a feel for them. We had numerous breakfasts on the balcony overlooking the ocean and many walks up and down the beach. See a few posts back to get a feel for the beautiful undeveloped beaches to the south. Check out the Condos page.